Tan Dun's and Ang Lee's individual bodies of work have focused on the meeting of the cultures of East and West, and the fascinating hybrid that results  something no longer wholly Eastern or Western. Tan Dun's four Orchestral Theater works explored the ways in which a classical Western orchestra can generate music that is neither classical nor Western. He has likewise sought to re-imagine and re-invigorate the Western concert experience through the integration of traditions from Chinese opera, Asian theater, ancient ritual and the addition of film and live video. Ang Lee's earlier films Pushing Hands, The Wedding Banquet and Eat Drink Man Woman have likewise explored the mingling of East and West in human-interest dramas about Asian families living under the influences of contemporary Western culture. Like Tan Dun's Orchestral Theater series, these films focus on that which is born of the cross-fertilization of cultures, traditions and generations. In developing the musical scores to accompany his films, Lee has sought out innovative composers who are adept at creating a contemporary sound in the blending of these two musical traditions. It thus seems a natural progression that Tan Dun's and Ang Lee's work should come together not only in the format of music accompanying images but also as a work in which images accompany music. 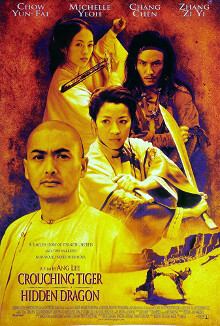 The Crouching Tiger Concerto, for cello and chamber orchestra, is a concert work based on Tan's Oscar-winning score for Lee's Oscar-winning film, Crouching Tiger, Hidden Dragon  a film which joins the quintessential Asian genre of martial arts cinema with the drama of a western romance with a deep metaphorical message. The concerto is in six movements with cello cadenzas connecting the orchestral movements. Each of the orchestral movements are accompanied by video footage created by Ang Lee and James Schamus. (Note: The video-accompaniment to the concerto is not currently available.) Although numerous concert works have been developed from film scores, this concerto is unique in that it brings the collaborative/creative process full circle. Tan's film score, written to strengthen and complement the viewing and dramatic experience of the film, was profoundly influenced by the film's poetic imagery, complex emotions, and exotic landscapes. In the creation of this concerto, the filmmakers were put into the composer's chair where Tan's evocative music inspired the reshaping of their images to accompany and enhance the concert listening experience. Lee and Schamus consider these video images as secondary to the music and they are not meant to impart any narrative to the concerto. The Crouching Tiger Concerto is highly reflective of Tan Dun's current interest in the historical cultures of the Silk Road. Woven into the film score and concerto are instruments, their performing techniques and articulations, and melodies native to the cultures which intermingled along the Silk Road in China's Xinjiang province. Of particular interest is the cello melody in the third cadenza which is a folk song from this region. Instruments heard in the concerto which are indigenous to these Silk Road cultures are the tar (a North African frame drum) and the bawu (a bamboo, copper-reed flute which came into China from Southeast Asia). The rawap (a high-pitched, plucked string instrument native to the Uygar culture of the Taklimakan area) is prominent in the film score and represented in the concerto in melodies and articulations transcribed to the cello and the orchestra. The erhu (a Chinese bowed string instrument which has its roots in India) is evoked throughout the concerto in the melodic contours and sonorities called for in the cello's melodies and cadenzas. Additional instruments from Silk Road cultures can be heard throughout in the gestures and timbres that Tan crafted into the scoring of this Western orchestra. The Crouching Tiger Concerto was written for and inspired by Yo-Yo Ma. The work received its world premiere in September 30, 2000, at London's Barbican Centre Festival: Fire Cross Water, of which Tan Dun was artistic director. ...The six-movement CROUCHING TIGER CONCERTO is based on music from his score for the film "Crouching Tiger, Hidden Dragon," and is an inviting amalgam of Chinese and Western timbres and gestures. As in ELEGY, the cello is given a richly lyrical line. But here the cello music is often dramatic and hard-driven as well, and by using sliding techniques and a bright timbre, Ms. Beiser sometimes made her instrument sound almost like an erhu, a Chinese violin. Chinese percussion instruments augment the Western orchestra, and among the work's most intriguing moments were cadenzas for percussion, and bawu and dizi flutes. Tan Dun's CROUCHING TIGER CONCERTO made a bold entrance, [at] its premiere. A multimedia collaboration, it brought together Tan and film director Ang Lee (with James Schamus) [for] Lee's latest film Crouching Tiger, Hidden Dragon. The CROUCHING TIGER CONCERTO is certainly unusual in the dominance accorded the score. The concerto incorporates images from the film, but Tan's score is more than just a soundtrack, for Lee and Schamus in turn reshaped their images in response to the music...the concerto consists of some half a dozen sequences for music and video, with interpolations for the trio soloists [which included] reflective cello cadenzas and warbling flutes.